Myanmar’s military is still persecuting ethnic Kachin, the predominant Christian group in a conflict-torn part of the country, as well as Rohingya Muslims, Cardinal Charles Maung Bo of Yangon has said. Speaking at a peace forum in South Korea, Cardinal Bo said the suffering the Rohingya have endured has captured the world’s attention and described their plight as an “appalling scar on the conscience of my country.” Yet other targeted groups are being overlooked as ethnic fighting rages on in northern Myanmar, with thousands of ethnic minorities having been injured, killed and displaced, he said. “Villages bombed and burned, women raped, churches destroyed, villagers used as human minesweepers and human shields,” Cardinal Bo told peace experts at the Korean Peninsula peace-sharing forum 2018 at the Catholic University of Korea in Seoul on Sept. 1. In his speech, Cardinal Bo elaborated on military air strikes in Kachin in February and a major offensive in April that led to more than 7,000 people being displaced. He said a series of “wars” were being raged in Myanmar against those who espouse religious freedom by forces preaching religious intolerance and hatred. 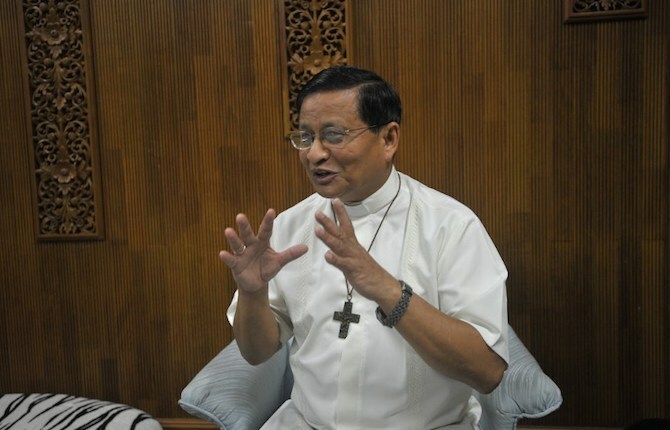 The cardinal also lamented a raft of violent conflicts due to land ownership disputes and other concerns including human trafficking, environmental degradation, drug abuse by young people, poverty and a lack of protection of basic rights. “These ‘wars’ continue even though Myanmar has moved over the past eight years through [a series of] reforms and made a fragile transition from a military dictatorship to a fragile democracy,” said the 69-year-old prelate. Fighting has broken out sporadically in the Christian stronghold of Kachin State since the country then known as Burma broke free of its colonial shackles in 1948 by gaining independence from British rule. The situation deteriorated in 2011 when some 100,000 people were displaced. Most of the state’s 1.7 million Kachins are Christians, including 116,000 Catholics. He has defended State Counselor Aung San Suu Kyi in her efforts to foster democracy by working with the military, despite calls for her to be stripped of her Nobel prize for staying silent about the persecution of the Rohingya. Myanmar is facing harsh criticism over rights abuses in Rakhine after a U.N. fact-finding mission found the military had committed gross human rights abuses in the state. Cardinal Bo also talked about establishing permanent peace on the Korean Peninsula amid a recent series of high-profile meetings between the leaders of South Korea, North Korea, the U.S. and China, Pyongyang’s key ally. He said the dream of nuclear disarmament and denuclearization on the peninsula was now becoming a possibility and urged continued dialogue. However, true peace can’t be realized when North Koreans are still being stripped of their human rights and basic freedoms, he added. The U.N. has described leader Kim Jong-un’s repressive policies as crimes against humanity. In North Korea, over 100,000 people remain incarcerated in prison camps, subjected to the most severe forms of torture, slave labor and abuse, in an environment where religious freedom is completely lacking. “Peace is born from the concept of human dignity,” Cardinal Bo said. “Every human being, including those who hate us, is made in God’s likeness. Hatred is taught through narratives of hatred. We can also teach every human soul to love,” he added.